When we fear public speaking or are required to give a speech you may ask yourself why is public speaking important? Believe it or not but public speaking is one of the most important skills you will ever develop in your life. Before we delve into my 11 solid reasons why public speaking is important (and why you should get good at it) I want to revisit some defining moments in history to display the importance of public speaking. Martin Luther King gave his “I have a dream speech” which inspired a nation and broke down racial barriers. Without his leadership and his inspirational speech it may have taken an extra 10 years to bring equality to all races. Abraham Lincoln’s Gettysburg address put him on the map for president. Without this speech he may never have been the icon he is today. Hilter’s many speeches were delivered with extreme passion and caused arguably one of the most horrific genocides of all time. Throughout history it has been public speaking that has united people and caused great change, both positive and negative. Public speaking is important, both in history and in your life. Public speaking will help you increase your self confidence dramatically. We live in a materialistic society and you can’t avoid that. A lot of our self worth and self esteem is gained by our perceptions of what we think other people think about us. Now this is obviously not ideal, it would be nice to get our self esteem from somewhere else, but we have to work with the hand we are dealt. By doing public speaking you are increasing your skill at communicating with others, making you more confident around people automatically, and it also increases your skill at perceiving people’s reactions to your message. This means in general conversation you can better understand what people are thinking and thus change what you are saying to make them think and feel the way you want them to. Thus you can help to make people think highly of you…devilish. I already highlighted this above but I will elaborate on it here. One of the worst things about being around other people is those awkward moments when neither of you know what you say or you fumble and say something stupid. Public speaking is important because it increases your skills at speaking (an activity we do every single day) and thus even when you are with one other person, as opposed to a group, you are less likely to be awkward and more likely to be comfortable and confident. If you own a business or do some form of work on the side public speaking is one of the best ways to generate sales. Understanding how to effectively get your message (and the emotions tied to that message) across to another person can help you generate more sales for your company. Public speaking skills are also important in securing a better job. It is how you present yourself at a job interview that will be the ultimate decider as to whether or not you land that higher paying job and whether or not you get paid in the higher bracket or lower bracket of pay rates. 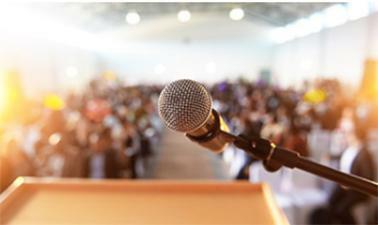 Public speaking still remains as one of the most effective ways to get your message across to a large audience. Almost every single person will need to speak in public at some point in their lives. Every public speaking opportunity is an opportunity to grow your leadership, your influence and your career. By becoming a confident and capable public speaker you instantly put yourself above many other people who refuse to stand up and speak. You might need to work in sales and speak to groups of people to sell product, you might need to give a presentation at a business meeting, you might have to give a speech at your daughter’s wedding. No matter who you are it is almost 100% certain you will need to give a speech at some point in your life. As we said above, every speaking opportunity is an opportunity to grow in leadership and influence. Having the opportunity to influence people’s thoughts (remember they’re taking time out of their busy head to listen to your thoughts on the world) put you in a position to create real positive change in people’s lives. In order for anything important to happen an idea needs to be transferred from one person to many. President Nixon did this when he inspired America to put a man on the moon. Public speaking is one of the great ways to get your idea across and make a difference. Public speaking will improve you communication skills, your leadership skills, your confidence and your ability to read and understand people, sometimes people need to go through a Corporate Communication Training in order to achieve this level of confidence. There are multiple other skills you will learn when public speaking that can actually boost your performance and fulfilment in other areas of your life. 90% of people will avoid getting up in front of people to give a speech. By standing up and speaking to a crowd you are positioning yourself as an expert in your field and you have a great opportunity to share your knowledge. One of the best ways to learn is to teach, and public speaking is exactly that…an opportunity to teach. Public speaking is important because it helps you to improve your knowledge. The preparation that goes into a speech and the fact that you have to work out how to communicate to others effectively makes you understand your content that much better. As I said before, probably 90% of people will avoid speaking up in a given situation…and probably even more people avoid public speaking. By having the confidence and ability to speak in public you can differentiate yourself in the workforce. This could put you in line for the next promotion or keep your head off the chopping block when the next redundancy rolls around. By standing up in front of people and delivering a talk you can attract like minded people around you. Seth Godin calls this a tribe and I think it is a great concept. You have come to this website because of words, videos and podcasts I have created and put out there. Hopefully you will stay and become a part of the tribe. By giving speeches you can help to build your own tribe of supporters. Leaders have people rallying around them. People who spend their lives to help the success of their leader. Wouldn’t you rather be a leader where people support you to help make you successful than support someone else’s success? Public speaking is extremely important if your want to be a leader. People follow leaders who inspire them and leaders who communicate their ideas effectively. If you can’t communicate with your tribe you can’t be a leader. I hope this post has answered your question as to why public speaking is important. Please go to http://publicspeakingman.com/free to get a free crash course in becoming a better public speaker.